The annual Planning Milestones report is a compendium providing selected information on the classified units and major unclassified properties that are currently or have in the past been associated with the California State Park System. 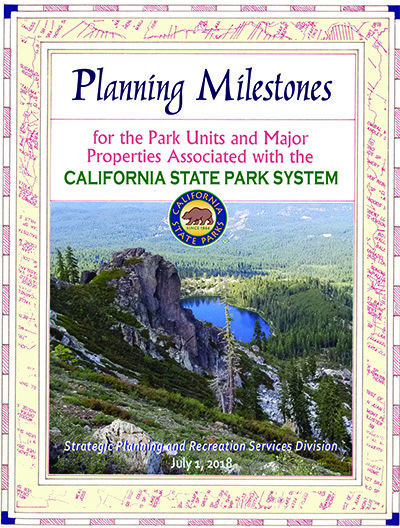 In the autumn of each year, the California Department of Parks and Recreation publishes a new edition of Planning Milestones for the Park Units and Major Unclassified Properties Associated with the California State Park System that provides detailed information on land use, resource management and operational planning which has been accomplished over the last half century for the individual classified units and major unclassified properties that are now or have ever been a part of the State Park System. Each annual Planning Milestones provides the definitive information, the information "of record", on the total number and specific identity of those classified units and major unclassified properties that constitute the State Park System as of July 1 of the year of publication. It indicates which units and properties have been added to (or removed from the system) as of the beginning of the new fiscal year, as well as what changes have been made in unit or property names and classifications during the previous fiscal year. In addition to the specific types of information noted above, there is a place for "comments", to note specific information which is useful in explaining the history of planning work accomplished for the subject unit or property. The report also gives a history of California State Parks general planning efforts and indicates the availability and location of the original planning documents. This document is accompanied by a map showing the location of the system’s units and properties current as of the time of the report’s publication. The most recent Planning Milestones publication (the text, tables and some of the maps) are available in electronic format through this Web page. It should be noted that, related to this set of Planning Milestone documents, the Department has created a database of the more than 900 "purpose statements" which are specific to the classified units and major unclassified properties which are currently part of or have historically been associated with the State Park System.